Ever wondered how cashew nuts which grown individually on trees make it into packets of nuts in your supermarket? Elizabeth, one of our local insiders in Southern Thailand, went into the fiery den, and lived to tell the tale. In front of Ja Dee's house in the village of Ban Rai Yai in southern Thailand there are several large canvas sheets spread with what looks like overgrown kidney beans. From inside the house comes the unmistakable and tantalising aroma of roasting cashew nuts, and through the front window, I can see someone pulling a large tray of nuts out of the oven. Sweet and creamy in texture, cashew nuts are a versatile ingredient used in sweet and savoury dishes alike, as well as a popular snack. Like most people, I have eaten cashew nuts my whole life, yet never stopped to consider how and where they grow, let alone the process necessary to bring them to market. Each nut must be individually handled using iron implements to patiently tap away at the kernel to remove the shell. Cashew nuts are an important crop in Thailand and grow mainly in the provinces of Nakorn Sri Thamarat, Krabi and Ranong. Each individual nut emanates from the end of a fleshy red fruit. The cashew fruit can be eaten raw and is slightly sour, leaving the mouth feeling dry. It is used more frequently in local curries and stir fries. The cashew nut - actually a seed - is encased in a hard shell, which is the true fruit of the tree. The first step is to dry the pods in the sun for around three days, gathering them in if the skies cloud over. 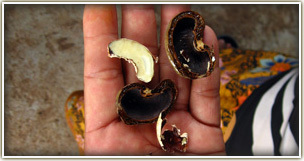 The flesh of the nut is encased in a layer of rubber-like substance which is very acidic and must be removed. Skin contact with the substance causes an uncomfortable burning sensation, so it is important that the nuts be as dry as possible before the next step in the process – the burning. After a glass of iced water that does little to cool me down, Ja Dee leads me around the side of the house to the burning pits. A man, covered from his feet to his head, with only a narrow slit open to see out of, tends the pits with a rake as the acrid rubber coating around the nuts burns to a blackened shell. I can only imagine how it would feel to work in such an inferno. The next step, chipping off the charcoal, takes place in the adjacent roofed area, open sided for maximum air-flow, once the nuts have cooled. Each nut must be individually handled by one of the workers crouching on cement platforms and using iron implements to patiently tap away at the kernel to remove the shell. Once roasted the nuts are sold, either with the outer skin still attached at a lower price, or skinned and golden at a higher rate. Ja Dee sells the nuts wholesale to local traders who come to buy at her door and on order throughout Thailand. The workers at Rewadee Nuts are largely women and children. They are paid by the kilo for the nuts they shell. The workers come and go at will. If they have the time – and inclination – they work to earn extra income for their families, or, in the case of the kids, pocket money to spend as they like. "The children enjoy working here," explains one of the mothers. "They can help their families by earning money for school fees and books during their holidays, and at the weekends, they can make money to buy the sweets and toys they want. They are very proud to be able to help out, and it really teaches them the value of money." Ja Dee is justifiably proud of her business. Twelve years ago, she began with nothing more than "the sarong I wore," and has built a successful business, selling nuts all over Thailand. A housewife with young children, she wanted her own house and income and had the idea of processing local nuts on a commercial scale. And she is hands-on - up at dawn and working until dusk, Ja Dee is involved in every step of the process. Ja Dee extended us the usual Southern Thai hospitality; we left Rewadee Nuts laden with product samples and Ja Dee smilingly agreed to showing Tell Tale Travel guests the cashew process first hand. Meet Ja Dee in person on any private tour with Tell Tale Travel taking in Krabi including the Lemongrass Trail and Action on Shore (perfect for families or active couples).